$1 Admission! ; Saturday July 15th and Sunday July 16th 10 a.m. - 4 p.m.
North Tonawanda, N.Y. – Enjoy $1 admission to the Herschell Carrousel Factory Museum during Carrousel Carnival Days! The Children&apos;s Gallery will be transformed into a carnival midway with games for the whole family to play. 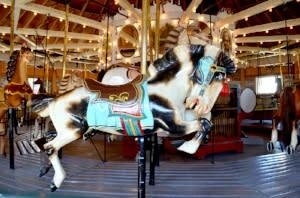 The Kiddieland Testing Park rides, Kiddie Carrousel, and 1916 Number One Special Carrousel will be open to ride. Game and ride tickets are only $.50 cents each! Ru&apos;s Pierogi will be on site Saturday July 14th from 11:30AM - 3:00PM. Lloyd Taco Trucks will be with at the museum on Sunday July 15th from 11:30AM -3:30PM. Entertainment will be provided by the Balloon Brothers and Squiggly Art Face Painting! Presale tickets for Canal Fest of the Tonawandas, Inc. will be available for purchase. The Herschell Carrousel Factory Museum is located at 180 Thompson Street, North Tonawanda, New York 14120.